Tonight, I was fortunate enough to attend the closing night of Broadway’s “The Scottsboro Boys,” the final collaboration by musical theatre luminaries John Kander and Fred Ebb. The enthusiasm, energy, and countless applause filled the theatre through the rafters! So many people turned out to see this final show: Brian Stokes Mitchell, Debra Monk, and Julia Murney were just a few of the folks I was sitting in the midst of, not to mention I was seated just a few rows behind John Kander himself! The final bows were very moving as the cast took them for the last time. John Kander made a beautiful toast to his friend and long-time collaborator Fred Ebb. It was truly a night to remember! 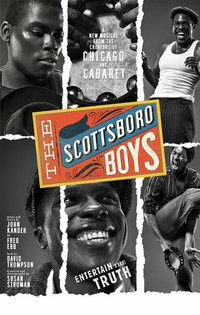 Now onto the show itself…”The Scottsboro Boys” is true piece of theatre and everyone who had anything to do with this production should be very proud to have brought this show to life for audiences to see and experience. It’s sad that such a powerful, thought-provoking, and entertaining show did not last longer. Starring fellow “Adaumbelle’s Quest” participant Joshua Henry along with John Cullum, Colman Domingo, Forrest McClendon, Sharon Washington, Josh Breckenridge, Derrick Cobey, E. Clayton Cornelious, Jeremy Gumbs, Rodney Hicks, Kendrick Jones, James T. Lane, JC Montgomery, Clinton Roane, Julius Thomas III, Robin S. Walker, and Christian Dante White, “The Scottsboro Boys,” based upon the famous “Scottsboro” case in the 1930s, tells the story of 9 African-American men who were unjustly accused of a terrible crime. Watching these actors bring this story to life was moving. I really felt a part of their journey and took some of it away with me as I left the show. Some of my personal favorite numbers were “Nothin’,” “Go Back Home,” “Make Friends With The Truth,” “That’s Not The Way We Do Things,” and “Never Too Late.” The lyrics to these songs really spoke to me and were so well performed! The whole cast should be applauded for a job well done, especially Joshua Henry (for a powerful and strong performance both acting wise and vocally), Sharon Washington (who is an integral part of the show, but doesn’t have any dialogue until the she utters her few lines in the final moments of the show), Jeremy Gumbs (at such a young age to be so talented with an amazingly strong and powerful voice), and James T. Lane (bringing his wonderful comedic timing to “Ruby Bates”). I am truly grateful for being able to see this show. It was an evening of theatre I will always remember! If this show ever comes back around, whether on tour or revived, I highly suggest going to see it! This show will not only entertain you, but it will make you think about the consequences of telling a lie to how the truth can set you free to equality, justice, and freedom for all. Thank you “Scottsboro Boys” for an engaging and entertaining night!